Izabella will be in Argentina with her dad for Christmas. 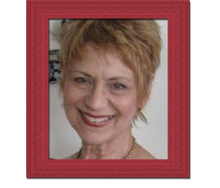 But for Thanksgiving, my hubby and I are taking the smaller grandkids to see "A Christmas Carol" and a stage show in Hollywood style next Saturday and afterward will have a buffet dinner at home with grandkids and their parents to give thanks for all our blessings. I will be giving her the gift that day. I approached the design by putting gesso on the box first then painted several layers of pink and white until I reached the perfect blend. 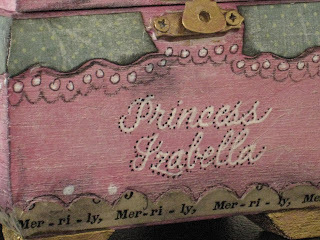 Izabella adores PINK and I wanted her to love it! I then collaged with childrens music sheet cutting it with a decorative scissors and doing the same with a complimentary decorative paper for the borders. I outlined with charcoal pencil and dotted with white pen for accent. Using a sponge to a black ink pad I rubbed along the edges to give an aged appearance. I painted the legs with gold acrylic as well as the clasp. 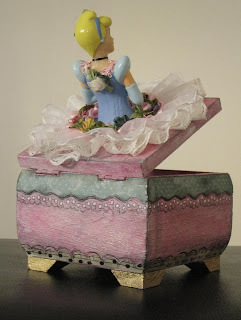 And, after adding decorative paper to the inside, I glued Cinderella on top and dress her with trim and ribbon, rosettes and rhinestones. 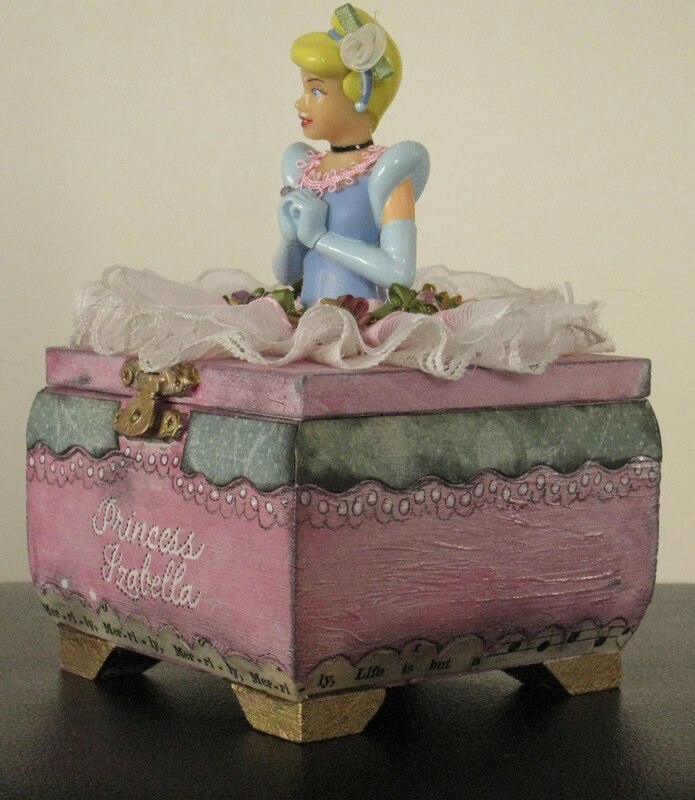 I personalized it "Princess Izabella" then gave it a final coating of acrylic crystal clear to seal. 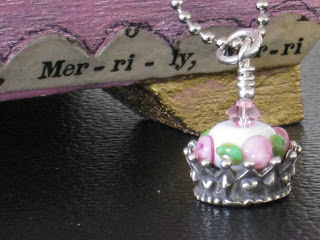 I attended the Rubber Stamp Convention in Carson last weekend and found a one of a kind charm that had a silver crown and with a white, pink and green glass bead on top...a perfect gift to put on a chain and put inside the Princess Box. She also loves Hello Kitty so I added a few little HK goodies to the box as well. Bella's mom, Anna, is an artist and a naturalist. She always prefer the hand made gifts to the purchased and I'm always willing to oblige. I feel assured that the gifts I make and give will be appreciated, taken care of and preserved so Bella will have them as she grows into an adult with hopes of her always remembering me. I know how I feel about the few things I have from my mom that I treasure and will pass along as well. I only wish I had realized what is meaningful to me now, back when I was younger. I could probably come up with a dozen or so quotes that would be perfect for this situation...but all I can think of is, I only know what is important today and I will take it into tomorrow to try and make a difference. 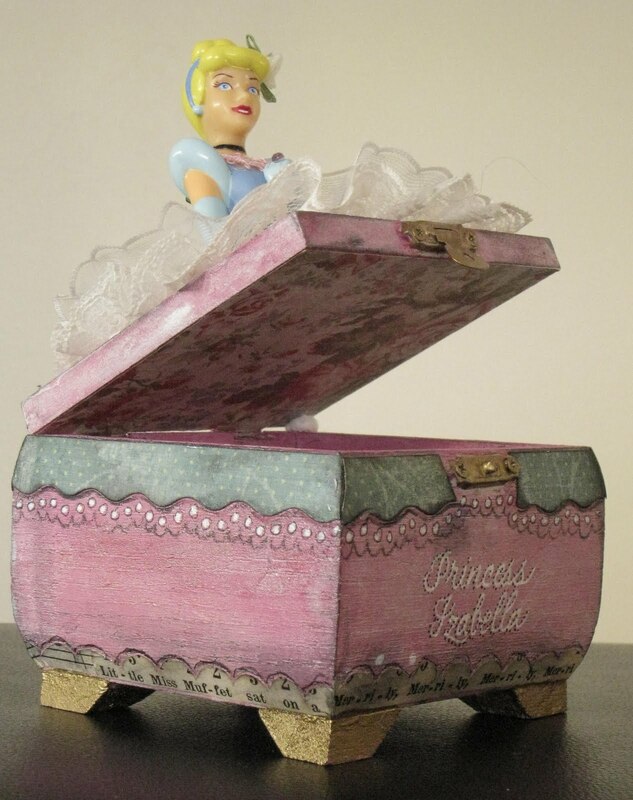 I think Princess Izabella is going to LOVE her beautiful treasure box!! 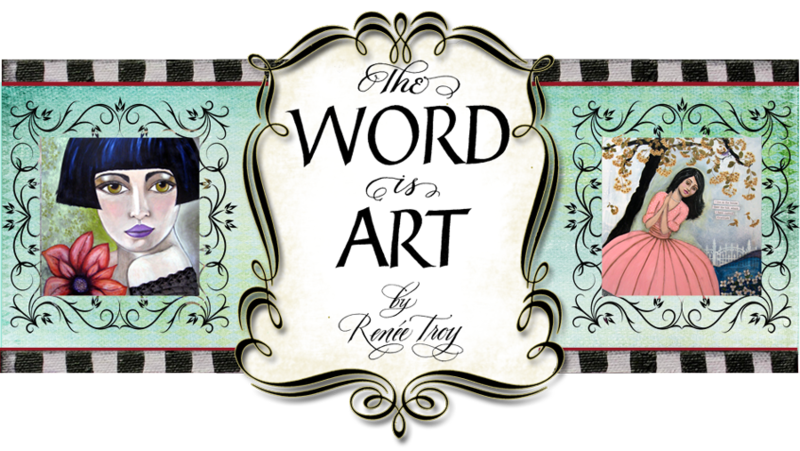 I see a lot of love in your gift Renee. 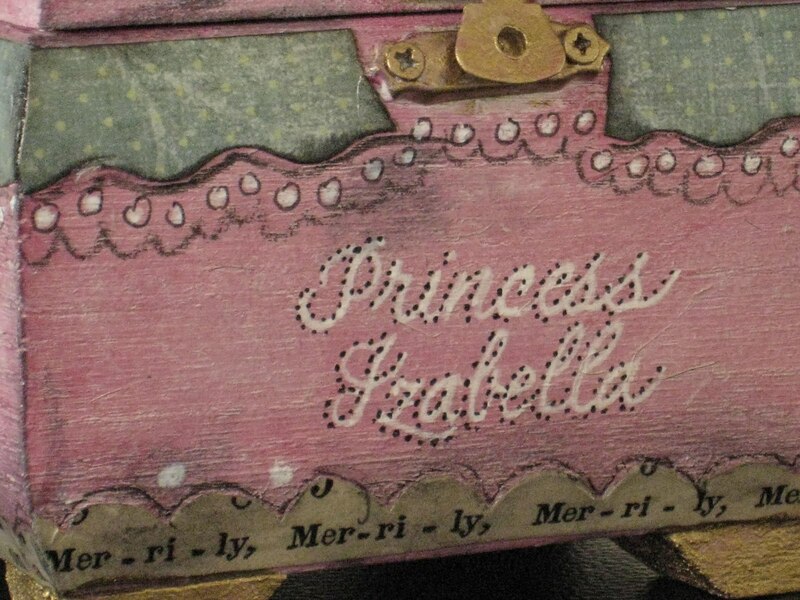 So nice for you to know that Bella's mother appreciates the hand made gifts and will treasure them. Thank you Jane and Hashi. 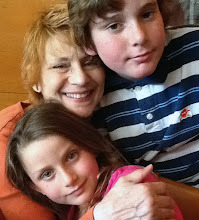 I'm a lucky gramma.